Franchise hamburger restaurants have mutually exclusive goals. First is to serve their meals fast and maintain consistency between restaurants. Second is to provide burgers and fries that customers will enjoy enough to return. Most of our national and international franchises score very high on that first point. They either prepare the burgers and fries ahead of time and drop them into our waiting bags or arraigned on a cold plastic tray. Or, as many now claim, run their factory manufactured supplies through a Henry Ford assembly line giving its customers a "home-cooked" meal in less than one-minutes and thirty seconds. These franchise restaurants are not as concerned about the quality of their cheeseburgers and fries as much as they are about employee speed and the hipness of its advertisements. Corporate suits know that the American public will purchase any meal as long as it is hot, greasy, salty and served as fast as its customers can pull the money out of their pockets. And for the most part, the general rabble that frequent these establishments just want food that they can eat without dripping all over their clothes as they drive the kids off to daycare. Carl's Jr., however, does an adequate job of blending these two goals. Their burger, although a frozen patty, had a nice, light smoke flavor, not too unlike what we may find in a backyard barbeque. The patty, however, was a bit dry and covered with a slice of American processed cheese. The bun is the standard sesame seed variety. The condiments included mayo, catsup, relish, slices of white tomato, pickles and whole leaf iceberg lettuce. Their fries are very similar to the tasteless white sticks found at McDonalds. They were hot and lightly salted but lacked any potato flavor. 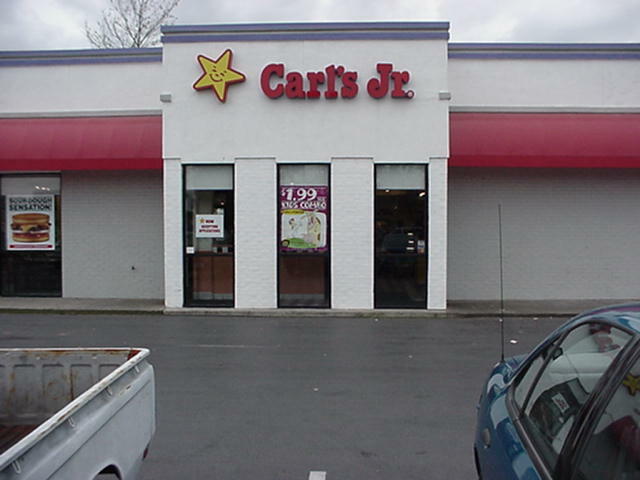 Carl' Jr. offers a better meal package than the other "Big 5," but it is still fast food and should never be confused with a product that we can hold above Chef LeMonde's head. Carl Karcher has taken the proven best qualities of all the fast food giants and wrapped them up into a pretty decent product. We ordered the famous star combo and the polite and very sharp cashier gave us a number. They have waiter service! We filled our soft drink at the self serve fountain and had a very pleasant 5 minute 45 second wait. The tables come equipped with salt, pepper, and napkins, most fast food places make you beg the "counter-mensan" for an extra napkin. When the meal arrived I was impressed by the presentation. The double wrapped burger was very appetizing. Although the fries had a genuine crisp to them, they were still McDonald's like in their character. The burger had great condiments, in our rating scale I had to give the condiments a 8/10! A skoash too much mayo lead to "B-" effort. The patty was the first of the lot that actually tasted like beef. I really enjoyed the subtle charcoal flavor and the whole sandwich together was hot and fresh.